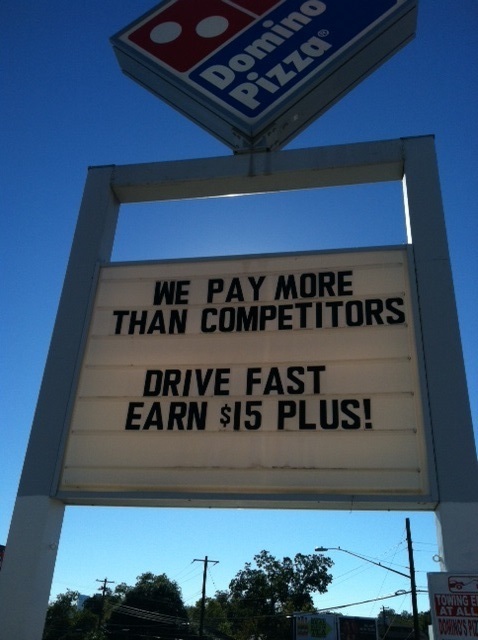 It looks like a Domino’s franchise near the UT campus has gone rogue. In their desperation to attract drivers, they have exposed themselves and their franchiser to massive liability and a public relations nightmare. A high-school or college kid takes the job. Believing that he can make more money by driving fast until in a reckless tragedy, hits a pedestrian (someone else’s son or daughter) and kills them. The pedestrian’s family files and no doubt wins a multi-million dollar lawsuit against Domino’s. The irresponsibly inspired delivery driver’s life is ruined and goes first to jail – and later, to be haunted with killing someone by accident simply to earn a few extra bucks. On top of the lawsuit, Domino’s experiences a public relations nightmare. ALL BECAUSE OF ONE STUPID SIGN! Next time you advertise for new employees, remember that “what you advertise, could reap what you sow.” Be responsible.